Provide comfort for the family of Cesarina Pertusi with a meaningful gesture of sympathy. 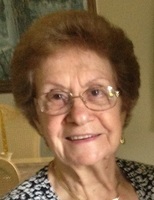 Cesarina “Rina” Pertusi, 86, of The Villages, passed away on Tuesday, April 9, 2019. Rina was born in Castagnole Monferrato, Asti, Italy on February 6, 1933. She and her husband Nemo married in 1958 and immigrated to West Springfield, MA prior to retiring to The Villages in 1993. Rina was a seamstress, specializing in intricate bridal gowns. She was an avid gardener, golfer as well as winner of individual and team bocce championships with her husband. She was also a great cook, known for her handmade ravioli and other Northern Italian specialties. Rina is survived by her son John of Washington, D.C. and her sister, Rosetta Peretti of Italy. She was preceded in death by her husband of 54 years, Nemo, in 2013. A Celebration of her Life will be held on Thursday, April 11, 2019 at 2:30 PM at Beyers Funeral Home, 134 N. Hwy 27/441, Lady Lake, FL. A visitation for family and friends will be at 2:00 PM. To send flowers in memory of Cesarina Pertusi, please visit our Heartfelt Sympathies Store. We encourage you to share your most beloved memories of Cesarina here, so that the family and other loved ones can always see it. You can upload cherished photographs, or share your favorite stories, and can even comment on those shared by others.